As a licensed Esthetician and borderline OCD label reader I am very cautious about what products I put on my skin. I also always want to remain credible here on my blog and for that reason you hardly ever see me name specific brands unless I truly believe they are stellar. 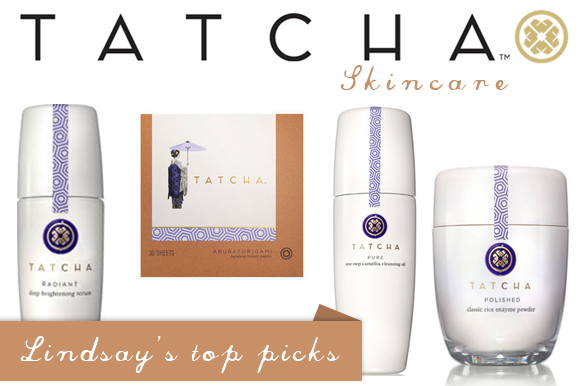 I recently reviewed a skin care line called TATCHA and after using their products for nearly three weeks not only do I feel very confident about using TATCHA on my skin but I feel confident about recommending the line to you as well. What initially drew me to the line was their minimalist approach to beauty. I was also so happy to see all their products are formulated without synthetic colors, fragrances, sulfates and parabens. TATCHA's four-step regime has proven age defying ingredients such as green tea (love), rice bran and red algea which bring Japan's timeless beauty rituals practiced by the iconic geisha to your everyday skincare routine. One of my biggest skin issues has been pregnancy induced hyperpigmentation that has decided to linger around for longer than I would have liked. After using the Radiant Deep Brightening Serum along with the Polished Rice Enzyme Powder and the One Step Camellia Cleansing Oil I am loving how my skin looks! It looks brighter, healthier and more even toned. Even my husband commented the other night that my skin looked great! Yeay for that. I also can not get enough of their Japanese Beauty Papers. I turn into this crazy shiny mess around 3pm every day and these easy to use blot papers that I keep in my purse instantly take care of any excess shine. And now the fun part for you...a giveaway! One lucky reader will get to choose between two of my favorite products, the TATCHA Radiant Deep Brightening Serum and the Polished Rice Enzyme Powder. Visit TATCHA and leave a comment below saying which of the two products listed above you would like to try. Please include your e-mail address in comment so I can be sure to contact the winner once selected. Tweet or mention giveaway on Facebook. I'd like to try the rice enzyme powder. I visited the website and they have a lot of good stuff! I have darkened skin on my neck from too much sun and would love to try radiant deep brightening serum! Those Japanese papers look fun, too! I'd pick the sampler set so I could try all the things! But I bet the lip balm is amazing, too! I'd love to win the Radiant Deep Brightening Serum! I would like the Radiant Deep Brightening Serum. Thanks for doing this! I'd love to try the Radiant Deep Brightening Serum!! I would love to try the Radiant Deep Brightening Serum! I cannot even begin to tell you how excited I am about this product. I am South Korean and have ALWAYS struggled with my skin, hyperpigmentation and finding the right products for me and my skin. I am definitely going to try this line. I would LOVE to try the sampler kit, because I feel like all the products could benefit me, and I want to try them ALL!!! Thank you for this post! I am so excited to try this! I love TATCHA! I use their eye cream and even though it is a little expensive it is the best eye cream I have ever used! What beautiful packaging on these products! I would LOVE to try the Deep Brightening Serum. I have put my skin through the ringer in the past decade and have been struggling in which direction to take my skincare regime. I would like to try the Radiant Deep Brightening Serum!! All the products look so tempting to try. I would LOVE to try the Radient Brightening Serum. I am currently 23 weeks pregnant and the hyperpigmentation is starting to show. I would love to try the cleansing oil and the brightening serum! would love to try the brightening serum- my skin is getting drier and more sensitive as i age, plus years of sailing have caused their share of sun damage... i'm willing to try anything! I would like to try the Polished Rice Enzyme Power! I liked and shared this giveaway on FB! I would love to try the Polished Rice Enzyme Powder, since turing 30 my skin has been a nightmare! Will be checking out these products, thank you for sharing! I too have lingering pregnancy mask and would love to try the brightening products! Love your blog, thank you for all your posts! Would love to try the Polished Rice Enzyme Powder! Thank you!!! I would love to try the Polished Rice Enzyme Powder - thanks! I'd love to try the Deep Brightening Serum! I would love to try the brightening serum! My son is three and I still have some lingering hyperpigmentation. I won't say how old my children are and I STILL have pigmentation! I would love to try the TATCHA Radiant Deep Brightening Serum. Would love a chance to try the deep brightening serum! My skin could really use it I'm afraid! I would love to try the Deep Brightening Serum! I'd definitely want to try the Deep Brightening Serum! I'd definitely love to try the Deep Brightening Serum. As a woman of color, I get hyperpigmentation spots whenever I get a pimple, so this would be amazing at evening out my skin tone. I also have pregnancy hyper pigmentation lingering and would love to try the Radiant Deep Brightening Serum! I would love to try the Radiant Deep Brightening serum. My skin could use some TLC! I would love to try the Radiant Deep Brightening Serum. Sounds awesome. I would love to try the Deep Brightening Serum. Thank You Thank You!! The Deep Brightening Serum looks like an amazing product, would love to try it on my hyperpigmentation. Thanks for the review and suggestion! I would love to let my best friend try the Radiating Deep Brightening Serum for her post-baby malasma that keeps her and that beautiful baby boy in hiding. Would love to try the serum. Thanks for the giveaway! Wow..what a giveaway! I would love to try the TATCHA Radiant Deep Brightening Serum. I'd love to try the deep brightening serum!! Hey! I would love to try the Radiant Deep Brightening Serum. Thanks so much for doing this! I would love the Radiant Deep Brightening Serum. Who doesn't need to have a deep radiating glow? Would love to win the Radiant Deep Brightening Serum for my mom to try! i would love the enzyme powder! I wanna try deep brightening serum. I would like to try are deep brightening serum. I'd love to try the POLISHED Gentle Rice Enzyme Powder and the RADIANT Deep Brightening Serum. I would love the Radiant Deep Brightening Serum. Looks wonderful. I would love to try the deep brightening Serum and the Cemellia Cleansing oil. I interested in this skincare line for a while now and would love love love to try it out I would love to try the Radiant Deep Brightening Serum. I would love to try the Brightening Serum! My face definitely needs a little brightening. I would love to try the Radiant Deep Brightening Serum. Thank you!! I checked out Tatcha's website & the products look amazing. I would love to try the serum. I have 3 little ones under the age of 6 & I could defintely use all of the help I can get!! I would love to try the polished rice enzyme powder!! I would pick the serum. I love hearing about skin care lines! Especially from you since you are the pro! Would love to try the radiant deep brightening serum. Thanks for the great giveaway. The brightening serum! I"m going to need it....!! I'd love to try the Radiant Deep Brightening Serum. Thanks! Ugg, I also have the pregnancy induced hyperpigmentation. Would love to try the radiant deep brightening serum. Thanks for the great giveaway! oooh! definitely the beauty papers and cleansing oil! TATCHA Radiant Deep Brightening Serum - daisieslam@yahoo.com. Thanks! also tweeted about the giveaway from @moorehe2! I'd love to try the polished rice enzyme powder! - makunz19@yahoo.com Thanks!!! TATCHA Radiant Deep Brightenin Serum - sierraroselee@gmail.com. These products really seem amazing. Thanks! I would love to try the TATCHA Radiant Deep Brightening Serum. These products look amazing. I've always been conscious of what I put on my skin and as I dive deeper into the Paleo lifestyle, I'm amazed at what companies put in our beauty products. Thank you for the review! I'd like to try the TATCHA Radiant Deep Brightening Serum. Thanks for the giveaway! The Tatcha Brightening Serum I would love to try. I have hyperpigmentation that no other product has helped. Maybe Tatcha can come to my rescue! Thanks. Would love to try the Deep Brightening Serum! Thanks for this giveaway! One Step Camellia Cleansing Oil ! I linked webpage on facebook! I would like to try the TATCHA Radiant Deep Brightening Serum. The deep brightening serum for sure! And the sampler set would of course be welcomed :)Thanks for doing a giveaway! Love your blog.